• Bracket for short-handled double chocks. 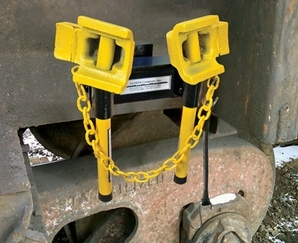 • Weld bracket to industry-owned freight cars so wheel chocks are always available. Bracket can also be welded to steel column at rail dock. • Fits Aldon chocks: 4011-03, 4011-04, 4011-05, 4011-09, 4011-10, 4011-30, and 4011-31.